Telford Copper & Stainless Cylinders specialise in the design and manufacture of high quality hot water cylinders. This family run business has been trading since 1989 from Telford and has always done so from the same premises. As the company has grown both these premises and the product range has expanded to keep up with increased demand and developing technology. From their original copper vented cylinders to their current range of unvented stainless steel cylinders and renewable energy solutions, Telford have maintained their reputation for quality and reliability. Telford stainless steel cylinders are made from high grade of stainless steel which the company claim is up to 40% thicker many other competitor products. The flagship model is the Telford Tempest which is available in variety of options including versions with gravity coils, triple coils and quad coils and models compatible with heat pumps and solar. Several are also available in slimline (up to 250 litres capacity) for homes where installation space is restricted. The Tempest offers fast reheat times between 18 – 29 minutes depending on the capacity of the cylinder. In addition to the Telford Tempest, the company now also offer the Tempest Plus and the Tornado 3.0. The Tempest Plus is an indirect cylinder and was developed to meet the ErP energy criteria and is banded A / B while the Tornado 3.0 is the latest and most advanced addition to the range. 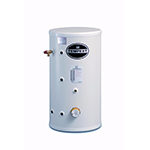 It features an internal expansion system removing the need for an external expansion vessel. To simplify installation even further Telford also offer the horizontal and pre-plumbed options as well ‘bespoke’ solutions for particularly unique installations. Tempest 90, 125, 150, 170, 200, 250, 300 C Telford’s flagship range which is also available in slimline, horizontal and pre-plumed options for easier installation. Direct or Indirect available. Tempest Solar 90, 125, 150, 170, 200, 250, 300 C Compatible with solar PV systems. Tempest Plus 90, 125, 150, 170, 200, 250, 300 A/B Telford’s premium model designed to meet ErP energy rating. Indirect model only but includes an immersion heater as backup. Tempest Heat Pump 90, 125, 150, 170, 200, 250, 300 B/C Available as a single coil option when a heat pump is the only heat source or twin coil if a boiler is to be used as well. Tornado 3.0 90, 125, 150, 170, 200, 250, 300 C Telford’s newest range featuring an internal expansion system removing the need for an external vessel. Available as indirect, direct, solar compatible and twin coil. Each unvented cylinder from Telford is protected by a lifetime guarantee but this only applies to the actual cylinder, not the rest of the components. These components include a 2 year guarantee to give you peace of mind. Telford offer a very competitive price range for their unvented cylinders usually costing between £400 – £900 depending on the model and capacity. However, you will also need to factor in the cost of installation which will vary from installer to installer. To get the best price for a new unvented cylinder we recommend that you compare quotes from at least 2 different suppliers. Complete our simple enquiry form to get free quotes from up to 3 qualified and reputable engineers in your area.